After years of gathering data, scientists on Wednesday revealed the first ever image of a black hole – and it's mass is more than six billion times more than the sun. 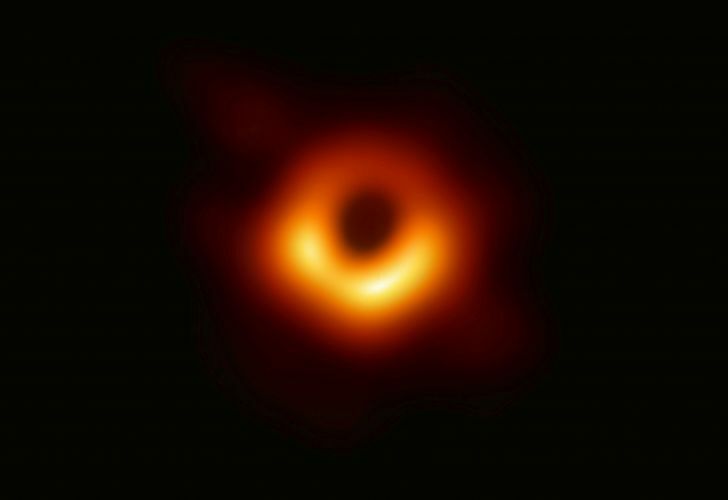 Scientists on Wednesday revealed the first image ever made of a black hole, depicting a fiery orange-and-black ring of gravity-twisted light swirling around the edge of the abyss. The picture, assembled from data gathered by eight radio telescopes around the world, shows the hot, shadowy lip of a supermassive black hole, one of the light-sucking monsters of the universe theorised by Einstein more than a century ago and confirmed by observations for decades. It is along this edge that light bends around itself in a cosmic funhouse effect. The black hole depicted is about six billion times the mass of our sun and is in a galaxy called M87 that is about 53 million light years from Earth. One light year is 5.9 trillion miles, or 9.5 trillion kilometres. The measurements were taken at a wavelength the human eye cannot see, so the astronomers added colour to the image, choosing gold and orange because the light and gas are so hot, heated to millions of degrees by the friction of gravity. The project cost somewhere between US$50-60 million, with US$26 million of that coming from the National Science Foundation. The telescope data was gathered two years ago, over four days when the weather had to be just right all around the world. Completing the image was an enormous undertaking, involving an international team of scientists, supercomputers, and hundreds of terabytes of data.